We are Gmail fans, no doubt about that. We use Gmail for just about everything – business and personal. However, we don’t wear blinders. We keep our eyes and minds open. We have couple of Microsoft accounts that we access at Outlook.com. We use Outlook accounts mainly to log in to our Windows 10 computers. But we also keep up with new features and changes that Microsoft is making to Outlook.com. So, if you’re using a Microsoft account… that would be any of the following: @outlook.com; @msn.com; @hotmail.com; @live.ca; @live.com, this tip is for you. Microsoft has been making a lot of changes to its Outlook.com Web site. Some of the newer features they’ve added like “Focused inbox” – we could care less about. But the one feature we find useful, and we’re sure some of you will to is the “Unsubscribe” feature which lets you unsubscribe from mailings of any sender… and if the unsubscribe option is not available to block all future emails from that sender and even delete all emails from that sender that are in your inbox or archive. So, it’s perfect if you really want to give someone the boot. Hopefully not us though! They say a picture is worth a thousand words, so we assume two pictures would be worth at least fifteen hundred? Here’s an email that I get every day and I’m not sure why. I’m not going to reveal the sender to you – some of you might actually enjoy their emails. I don’t mind them, but I don’t have time to read two or three of these a day. Plus… I don’t remember ever subscribing to it. OK it’s not all bad, but they send two or more emails EVERY day and I’ve had enough. Enough, I tells ya! However, sometimes unsubscribing is not an option. 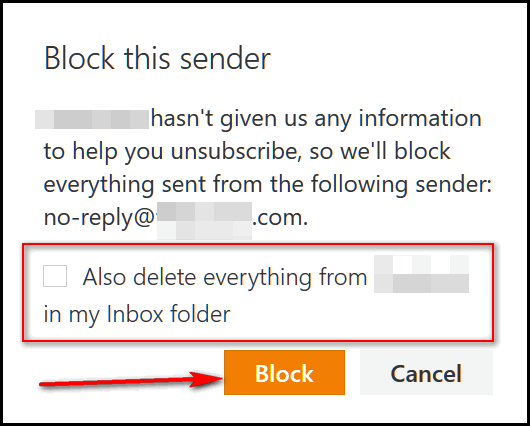 If Outlook.com does not have any information to help you unsubscribe, it will give you the option to block “everything sent” from the unlucky sender. And if you’re really not in the mood for their emails and don’t ever want to cast your eyes upon anything they’ve sent you in the past, you have the option to delete everything from this wayward sender that is still in your inbox. It would seem Gmail’s “Report as spam” feature provides some of the same features, but without the finesse of Outlook’s unsubscribe feature.. But either way… as long as unwanted email never shows up in the inbox again, maybe finesse isn’t all that important. 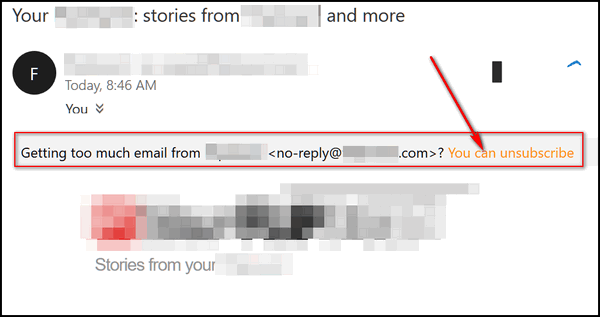 We like this new feature of Outlook.com. Maybe you will too. If you don’t have an Outlook.com account, you can get one free here. I have Outlook.live.com – and how weird… I can’t receive email in my “Inbox” … through… I receive recent “Junk Mail”; because of this I had to use another email program.